Last Model Home is NOW Under Contract – Only 17 Opportunities Remain! 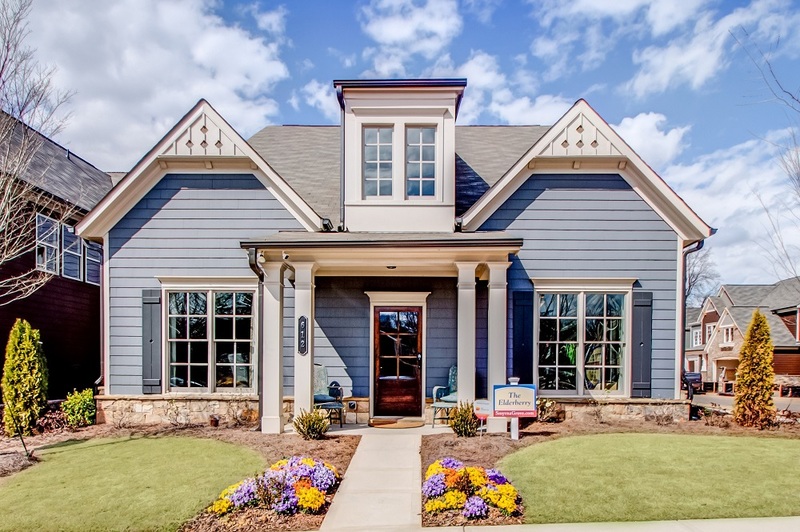 Smyrna Grove has just announced that they have put the last model home under contract and only 17 opportunities remain at this excellent community! 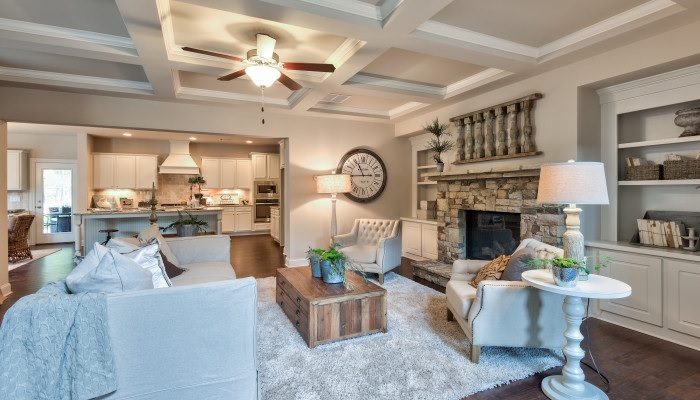 Smyrna Grove offers exceptional value and timeless quality is in each and every home. Wonderful and well-appointed luxury finishes such as hardwoods in extended foyer, kitchen, breakfast and powder room. When only the best will do, expect to be impressed with gorgeous detailing throughout the home including crown molding in foyer, kitchen, living area, and master bedroom. The city of Smyrna is so unique that it just made Money Magazine’s list of the top 50 places to live in America at number 44 for 2018. What makes it so great according to Money? A century later, the city was transformed yet again — this time with a vision for a thriving downtown that fosters a sense of community and fights the sprawl of greater Atlanta. The Village Green encompasses City Hall, housing, a library, arboretum, shopping and apartments. Built around a central fountain, it’s a gathering place that hosts popular festivals and concerts year-round. The Smyrna area is very exciting with great restaurants like J. Christophers opening soon in Belmont Shopping Center. Emory Healthcare is now open and just 3 miles from Smyrna Grove. Other attractions near by include Suntrust Park for events and games and The Battery open year round. ACT FAST to get $5K in closing costs with preferred lender* at Smyrna Grove. One of four preferred lenders are onsite most weekends. Taste of Smyrna Coming Soon! Check out your new home at Smyrna Grove – Limited Opportunities Remaining! What could be more fun then to experience a wide selection of foods and tons of entertainment while saying goodbye to summer? The Taste of Smyrna is food, fun and music all day long! Nibble and nosh your way around the Village Green Saturday, Sept. 15 from 11:00 a.m. – 8:00 p.m. Admission is FREE and samples can be purchased from $0.50 up to $4 dollars. There will also be a wide variety of children’s activities from a Quad Bungee, Rockwall, inflatable slides, bounces, obstacle courses and much more. Make your plans to eat, drink and listen to music all day long all on the beautiful Village Green in downtown Smyrna. Look for updates here, Facebook and Twitter. No need to wait until Taste of Smyrna. Come any weekend or during the week and enjoy the Smyrna area. The Smyrna area is filled with great restaurants like J. Christophers opening soon in Belmont Shopping Center. Emory Healthcare is now open and just 3 miles from Smyrna Grove. Other attractions near by include Suntrust Park for events and games and The Battery open year round. Stop by and tour the model home at Smyrna Grove offering exceptional value and timeless quality is in each and every home. Wonderful and well-appointed luxury finishes such as hardwoods in extended foyer, kitchen, breakfast and powder room. When only the best will do, expect to be impressed with gorgeous detailing throughout the home including crown molding in foyer, kitchen, living area and master bedroom. Sales handled by Berkshire Hathaway HomeServices – Georgia Properties – New Homes Division. *See agent for full details and requirements. 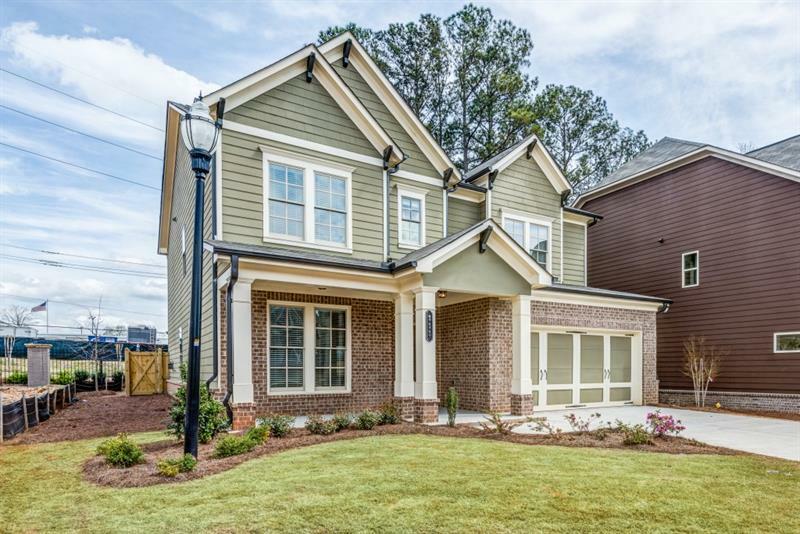 Smyrna Grove is now in its FINAL PHASE with less than 22 homes remaining! Act Fast to choose your new home at this 2016 Community of the Year alive with world-class amenities and a friendly neighborhood that reaches out to the home buyer to say welcome home. Smyrna Grove won several 2016 professionalism awards at the OBIE’s including the coveted Community of the Year. Home prices are on the rise, yet interest rates are still historically low. If you compare today’s interest rates with past interest rates, you will quickly see that you will get much more for your money when you choose to purchase now. Since the beginning of the year, mortgage interest rates have risen over a half of a percentage point (from 3.95% to 4.52%), according to Freddie Mac. Even a small rise in interest rates can greatly impact a buyer’s monthly mortgage payment. According to an article in Forbes.com ” Change nothing except your interest rate and immediately buying a home becomes more expensive because you’re paying more for the same product. You’ll find that the amount you can qualify for will be reduced considerably if interest rates go up by 1%. Smyrna is an exciting area with great restaurants like J. Christophers opening soon in Belmont Shopping Center. Emory Healthcare is now open and just 3 miles from Smyrna Grove. Other attractions nearby include Suntrust Park for events and games and The Battery open year round. Smyrna is hopping! Great events, great baseball and most of all fantastic new homes! Looking for something fun to do? Come out on August 4th between the hours of 6:00 pm to 10:00 pm. for the 2018 Smyrna birthday Celebration! The annual happening is tons of fun with fireworks at the end! Celebrate the birth of Smyrna with family and friends. High-energy music, festival foods, birthday festivities, a GIANT birthday cake by McEntyre’s Bakery and a kids entertainment area add to the excitement…be there! Come a little early and stop by Smyrna Grove, now in its FINAL PHASE with less than 30 homes remaining. Act Fast to choose your new home at this 2016 Community of the Year alive with world-class amenities and a friendly neighborhood that reaches out to the home buyer to say welcome home. Smyrna Grove won several 2016 professionalism awards at the OBIE’s including the coveted Community of the Year. Smyrna Grove offers exceptional value and timeless quality is in each and every Southeast Capital Companies and Home South Communities home. Wonderful and well-appointed luxury finishes such as hardwoods in extended foyer, kitchen, breakfast and powder room. When only the best will do, expect to be impressed with gorgeous detailing throughout the home including crown molding in foyer, kitchen, living area, and master bedroom. The Smyrna area is very exciting with great restaurants like J. Christophers opening soon in Belmont Shopping Center. Emory Healthcare is now open and just 3 miles from Smyrna Grove. Other attractions nearby include Suntrust Park for events and games and The Battery open year round. Smyrna Grove is now in it’s FINAL PHASE with less than 30 homes remaining! Act Fast to choose your new home at this 2016 Community of the Year alive with world class amenities and a friendly neighborhood that reaches out to the home buyer to say welcome home. Smyrna Grove won several 2016 professionalism awards at the OBIE’s including the coveted Community of the Year. In a recent article in KeepingMattersCurrent.com; the affordability question came up. Are homes still affordable in 2018? This article says yes! “Rising home prices have many concerned that the average family will no longer be able to afford the most precious piece of the American Dream – their own home. However, it is not just the price of a home that determines its affordability. The monthly cost of a home is determined by the price and the interest rate on the mortgage used to purchase it. Today, mortgage interest rates stand at about 4.5%. The average annual mortgage interest rate from 1985 to 2000 was almost double that number, at 8.92%. When comparing affordability of homeownership over the decades, we must also realize that incomes have increased. Smyrna Grove offers exceptional value and timeless quality is in each and every Southeast Capital Companies and Home South Communities home. Wonderful and well-appointed luxury finishes such as hardwoods in extended foyer, kitchen,breakfast and powder room. When only the best will do, expect to be impressed with gorgeous detailing throughout the home including crown molding in foyer, kitchen, living area and master bedroom. The Smyrna area is very exciting area with great restaurants like J. Christophers opening soon in Belmont Shopping Center. Emory Healthcare is now open and just 3 miles from Smyrna Grove. Other attractions near by include Suntrust Park for events and games and The Battery open year round. Smyrna Grove has just announced that they will have homes ready in just 60 days! Come out to check out the Cypress, Douglas and Leyland plans ranging in price from $410, 000 to $475,000. 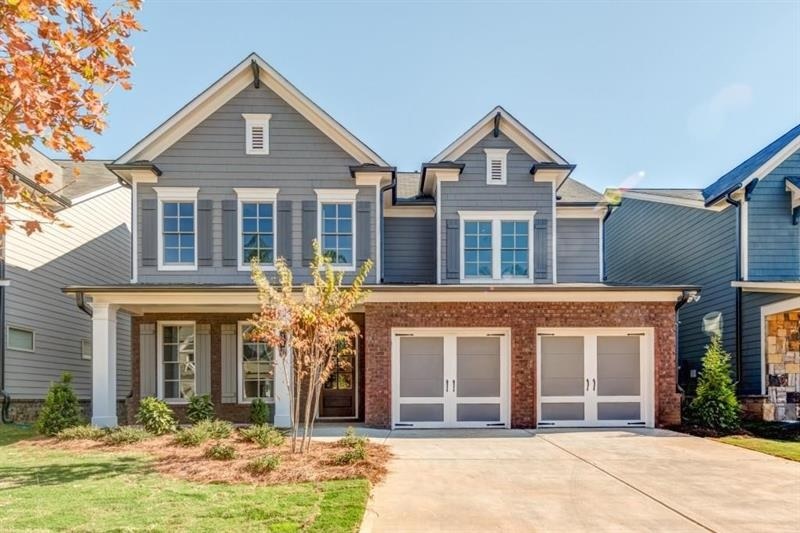 On Homesite 179 – $462,769 | 4 BR, 3 full & 1 half BA -Douglas Plan-this home offers a huge front porch, open layout is ideal for entertaining, beautiful kitchen w/highend appliances, huge island overlooks family room. Wall of windows lets in plenty of natural light! Large breakfast room off kitchen, study on main & tons of upgrades! Upstairs offers a spacious master suite with a luxury bath and large closet. Three additional large bedrooms with 2 baths. I Jack and Jill and 1 private bath. 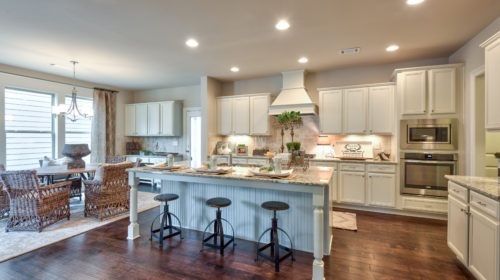 Only Thirty Opportunities Remain at Smyrna Grove – Basement Homesites Available with $15K Design Incentive – ACT FAST!